Russell Maliphant Company is recruiting new dance artists and assistants to join the education team. Where: Audition in London, UK. Work will be in various locations. When: 13 October 2018. Ongoing freelance work. Deadline for applications: 3 September 2018. Russell Maliphant Company was established in 1996 as the framework for Maliphant to initiate productions and to work with his own ensemble of dancers. Since that time we have received two Olivier awards, three South Bank Show awards and three Critics’ Circle National Dance awards for best modern choreography, amongst many other national and international awards and nominations. 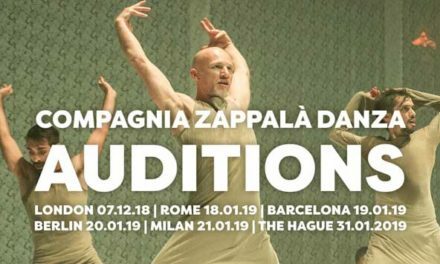 Russell Maliphant Company is now building a team of dance artists and assistants who can deliver high-quality dance sessions as part of the company’s engagement programme. A particular focus for 2019 will be learning and participation activity to accompany the company’s tour of new production Silent Lines (premiering in April 2019) as well as settling into our new home in the East of England. We are looking for dance artists with a minimum of five years teaching/facilitating experience who are passionate about inspiring people of all ages and abilities to dance. You will be a strong technical dancer who also enjoys facilitating creative tasks. We are also looking for dance professionals with less teaching experience to join our team as assistant dance artists. You may have recently completed professional training or are looking to build your career as a dance facilitator. You should be keen to develop your dance teaching skills, progress within the company, and be excited about sharing dance opportunities with others. Availability: Teaching work will be offered on a freelance basis. Safeguarding: Due to the nature of work, the posts are offered subject to an enhanced DBS disclosure, and successful completion of online safeguarding training. Application deadline Monday 3 September 2018, 12noon UK time. Your video must not exceed 5 minutes and must be of good quality. Please make sure it includes performance and/or teaching footage. You must be clearly and completely visible. If there are other performers in the video, please make sure you clearly indicate who you are and highlight the sections you performed in the “Video Notes” field on the application form.